A sweet, bright, and tart dip made from roasted peppers and walnuts is a great appetizer or addition to a mezze meal. 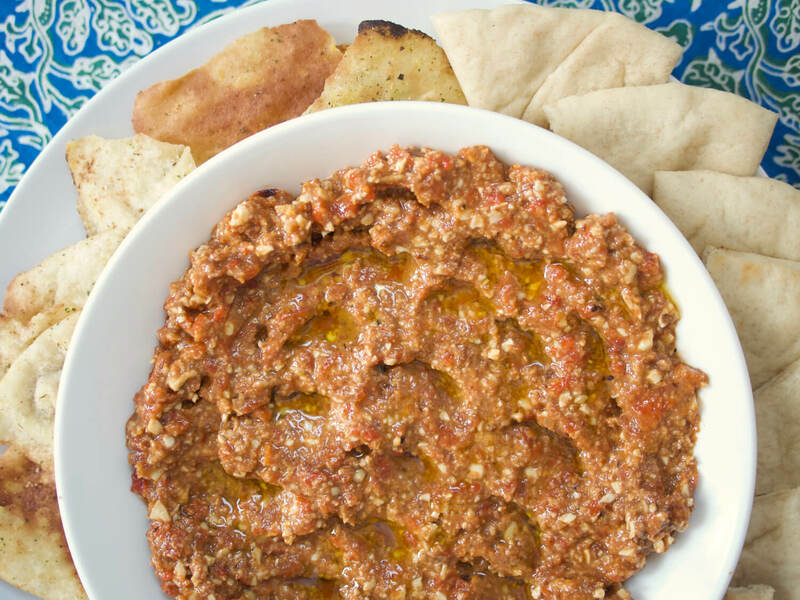 The word “muhammara” in Arabic translates roughly to “reddened,” which is completely appropriate for this spread. Sweet roasted red peppers provide the base, with crunchy bits of toasted walnuts providing texture. Cumin, Aleppo-style chili flakes, and hot paprika add a depth of spice and heat, while pomegranate molasses and lemon juice provide a punch of tartness. This dip can be made without a food processor, as it’s not intended to be a uniform paste, like hummus. It’s delicious served with pita or crudités, but can also be added to sandwiches, dolloped on scrambled eggs, or used anywhere else that you might want to add a pop of flavor! First, roast the peppers. If you have a gas stove, place peppers directly over flame and roast, turning occasionally with tongs, until skin is charred all over. If you only have electric burners, place peppers in a rimmed pan that will fit under your broiler and broil on high, turning occasionally, until charred all over. A gas grill can also be used, if that's convenient. Place charred peppers in a bowl and cover. Allow peppers to cool to room temperature while you prepare other ingredients - cooling the peppers covered makes the skin a bit easier to remove. While the peppers cool, chop the walnuts -- they should be a bit finer than roughly chopped, in fairly even pieces around the size of Israeli couscous. Once the peppers are cool enough to handle, peel them and discard the seeds and skin, working over a bowl to catch any roasted pepper juices that escape. Roughly chop the peppers. At this point, you can use any one of three methods to bring the dip together - mortar and pestle, food processor, or knife chopping. For the most authentic texture, use a mortar and pestle to combine the peppers, breadcrumbs, lemon juice, pomegranate molasses, cumin, chili flakes, paprika, and garlic. The mixture should still have a bit of texture to it, but the ingredients should be evenly combined. For the most convenient method, add the peppers, breadcrumbs, lemon juice, pomegranate molasses, cumin, chili flakes, paprika, and garlic to the bowl of a food processor. Process until roughly pureed, but not a completely even paste. For a method that doesn’t use any special equipment, use your knife to finely chop the peppers on a cutting board, aiming for a texture that’s close to a rough puree. Transfer to a medium bowl and stir in the breadcrumbs, lemon juice, pomegranate molasses, cumin, chili flakes, paprika, and garlic. No matter which method you choose, once you have the pepper mixture processed, transfer to a medium bowl and stir in the chopped walnuts, ¼ tsp. kosher salt, and olive oil. Taste for seasoning and add more salt or pomegranate molasses as desired. The flavors should be intense but balanced. Transfer mixture to a shallow serving bowl and use the back of a spoon to create a wavy pattern in the surface. Drizzle with a bit of olive oil and serve. Serves 4-6 as an appetizer. Adapted from Yotam Ottolenghi. Vanns Fajita Seasoning doesn't need to stay inside of a tortilla - it makes for a great fajita-inspired turkey burger as well!